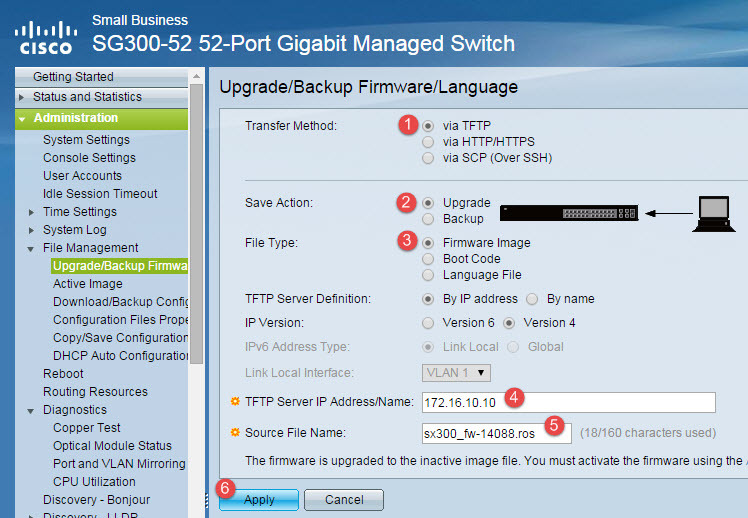 Right on the heels of my long post around a new network design, I hit the wall on available ports with my HP V1910-24G. Considering that I am burning 4~5 ports per ESXi host, plus 1~4 ports per Synology NAS, along with some extra stuff, and you can see why the ports go quickly. I thought this would be a great time to pull the trigger on a different switch so that I could compare and contrast them. 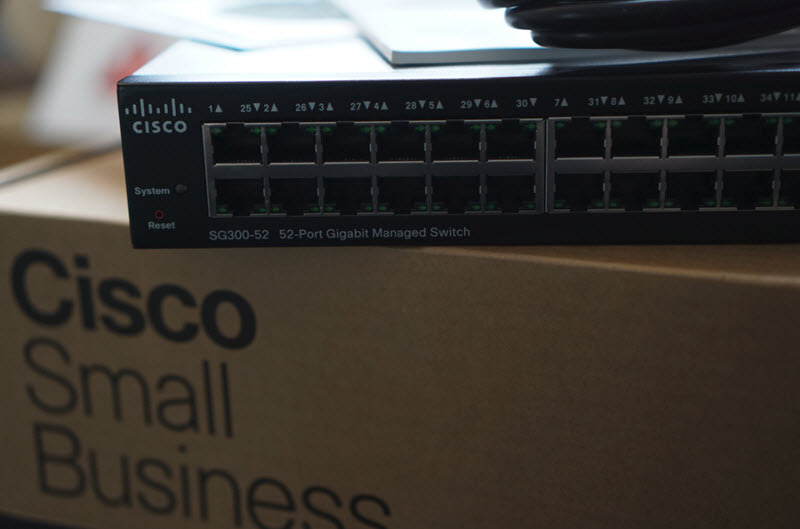 I went with a Cisco SG300-52 switch. It’s their mid-level SMB switch and has far too many bells and whistles to count. 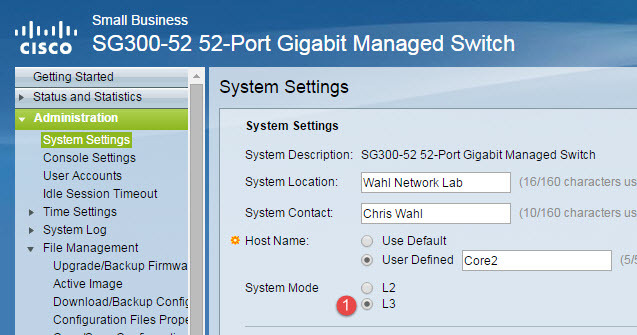 Importantly, it does have layer 3 switching, a fairly decent sized VLAN table, and the ability to do 1Gb on every port. 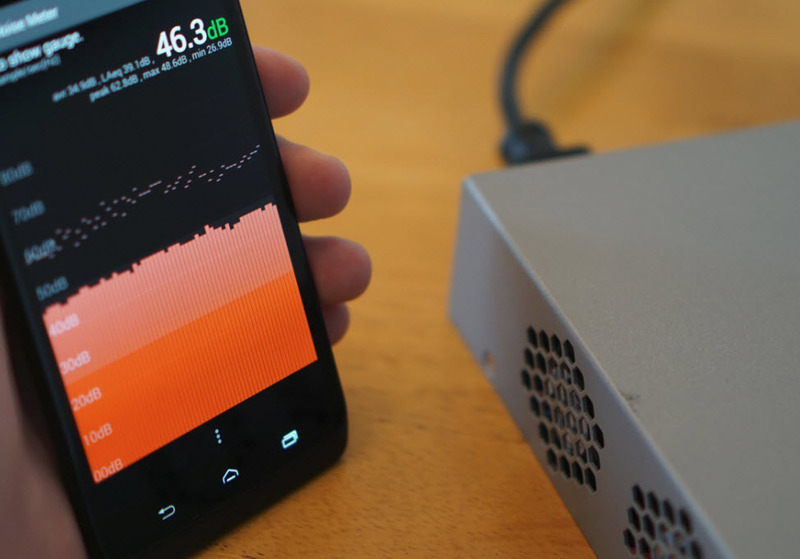 In this post, I’ll cover some of the setup and configuration details, along with a reading on the noise levels. 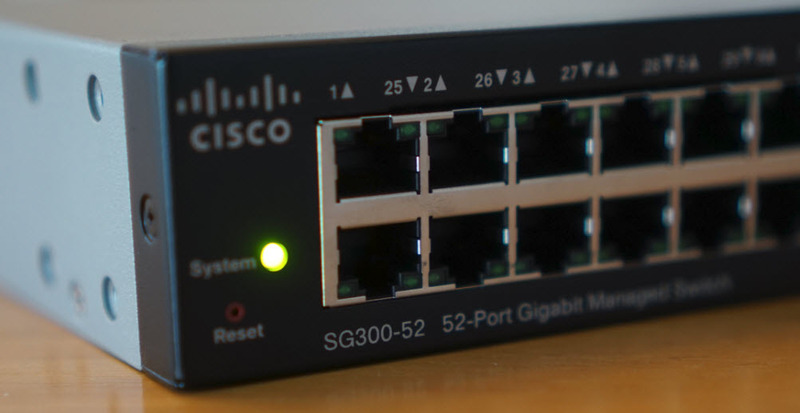 As I build out a new lab network design, and get more stick time with the switch, I’ll follow-up with another post that outline my feelings on that subject. 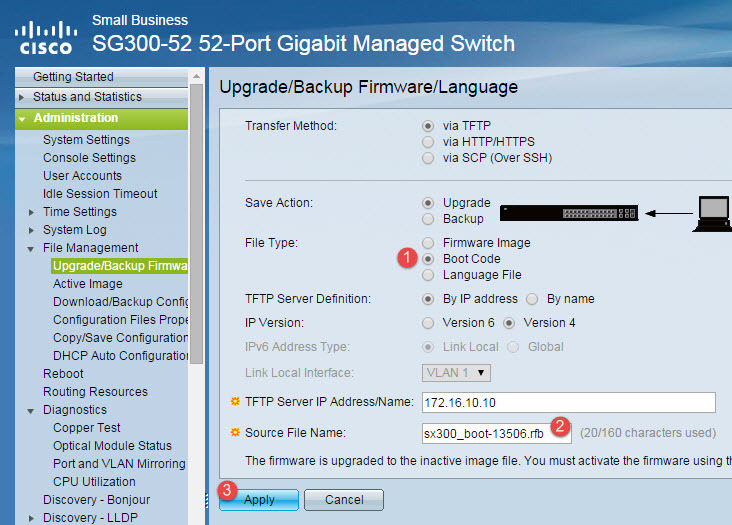 The SG300-52 is auto configured for DHCP. 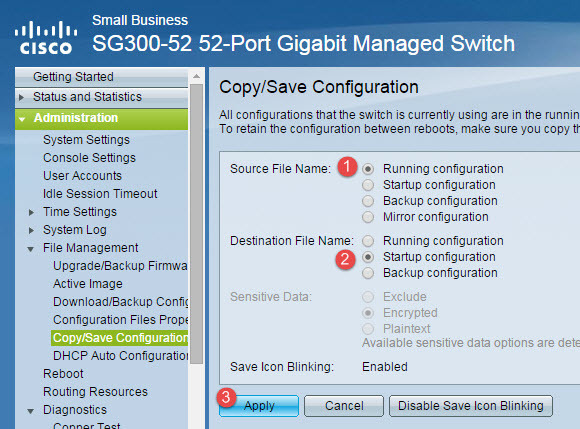 To perform the initial setup, I plugged in one of the switchports into my existing HP V1910-24G switch using an access port configuration. Once the switch acquires a DHCP address, the System light stops flashing and remains solid green. 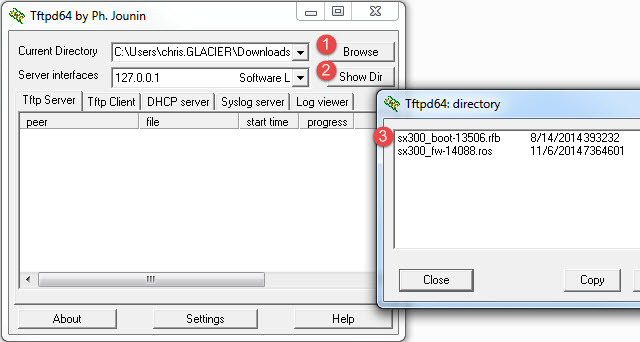 Only the firmware image can be uploaded via the web; the boot code must be uploaded via TFPT or SCP. I opted to use Tftpd for both, available on this download page for free. Fire up Tftpd and point it to your SG300 extracted zip folder. Then click the Show Dir button to view the files in this directory. You can copy the filenames using the Copy button. Enter the firmware file name. You should see an active download from your TFPT server. Once completed, repeat the process for your boot code. Now that the firmware image is uploaded, you can activate it. Navigate to Administration > File Management > Active Image. Change the Active Image After Reboot to the 1.4.0.88 image (or whatever you uploaded). Finally, save your configuration and reboot the switch. To do this, navigate to Administration > File Management > Copy/Save Configuration. The defaults are fine (running configuration to startup configuration). Click Apply. Navigate to Administration > Reboot. Make sure Immediate is selected, and click Apply. The switch will be unavailable for a minute or so while it reboots. Don’t do this outside of a maintenance window. I also decided to enable a few other features. The first being Layer 3 mode to allow for L3 SVIs. You can find this in Administration > System Settings. It requires a reboot, but make sure to save your configuration first. And finally, enabling SSH access. You’d think it would be in SSH Server somewhere, right? But, you’d be wrong (I certainly was). It’s actually in Security > TCP/UDP Services. Once you’ve enabled SSH, you should … (can you guess what I’m going to say?) … save your configuration! I find noise levels to be incredibly important because all of my home lab gear sits inside of my home office. I try to keep noise levels at my chair to 35 dB or less. So, I fired up the SG300-52 in a quiet room and took some samples. 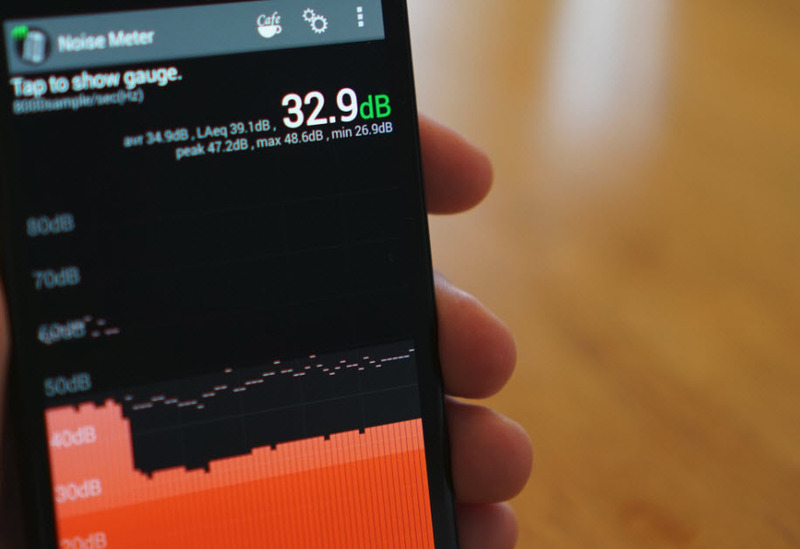 Using the Noise Meter app for Android, I placed the microphone near the fans to measure the amount of dB being produced. On average, the value was 46 dB. I then placed the microphone at a distance of 4 feet and measured again. The noise levels held steady at around 33 dB. This is roughly the distance from the switch to my chair in my home office. This is an acceptable amount of noise for me. The noise does not change when the switch boots up; it remains at a constant state. The fan speed does not appear to be adjustable, as the health status simply shows that the fans and temperature are at an OK value. Web interface is super peppy, especially compared to my HP V1910. We’re talking 3x-4x faster response time. The firmware image and boot code is super easy to find, and relatively easy to install. A billion features, most of which I’ll never use. 4 more ports than most switches, even though the last two ports are shared with SFP slots (which I will likely never use). Tolerable amount of noise from the fans. I could probably replace them with something if I cared enough. From a setup and configuration standpoint, the interface is annoying with all of the popups and reminders to save your configuration. The user interface is cluttered with too many menus. If I expand them all, it takes up 3~4 pages (vertically) of my browser. I found it difficult to find things for the first time. Cost is around ~$11-$12 per port, which is high. I’m also in the market for a layer 3 switch for a home lab also. How does the noise level of the HP V1910-24G compare to the SG300? The Cisco is a few dB louder, but it’s also a much larger switch. The 28 port version of SG300 is fanless. This is what I am running in my home lab. Does it have the funky limitation that the SG300-10 has where it can route IPv6, but only to/from 1 vlan? @nevynxxx – I’ve set up IPv6 routing on VLAN30, along with some other v6 goodies, which seems to confirm v6 works like a charm. Perhaps the version of firmware/boot code you’re using had support issues? you need to set the layer 3 system mode, save configuration and reboot. Now it will work. I have been trying to figure out all the differences among the main Cisco switch models. But this is almost impossible( I couldn’t even think that it can be that painful to learn all that. 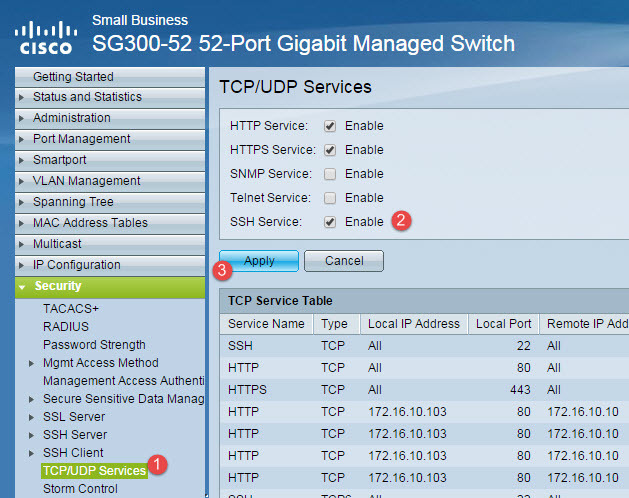 Whether such a switch – http://hardware.nl/switches/cisco/catalyst/ws-c2950-12.html would be good enough for home use?